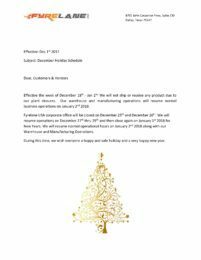 Fyrelane USA corporate office will be closed on December 25th and December 26th. We will resume operations on December 27th thru 29th and then close again on January 1st 2018 for New Years. We will resume normal operational hours on January 2nd 2018 along with our Warehouse and Manufacturing Operations.